For most of publishing history, books for children meant primers and preachy religious texts, not mythical worlds invented just for kids. It’s true that fairy tales may have been specifically targeted to the young, but they were never childish. (See the original Grimms' tales.) By the 19th century, however, the situation had dramatically changed. And by the turn of the century, childlike fairy stories and fantasies enjoyed wide popularity among grown-ups and children alike, just as they do today. Witness the tremendous success of Peter Pan. The character first appeared as a seven-day-old baby in a satirical 1902 fantasy novel by Scottish writer J.M. Barrie. The novel became a play. Pan was so beloved that Barrie’s publisher excerpted his chapters and published them as Peter Pan in Kensington Gardens. Then followed Barrie’s 1904 play, Peter Pan, or The Boy Who Wouldn’t Grow Up, in which baby Pan had grown up at least just a little. Only after this history of Pan entertainments did Barrie write Peter and Wendy, the story we learned as children through Disney adaptations or the 1911 original. Pan’s influence is wide and deep, and over a century long. 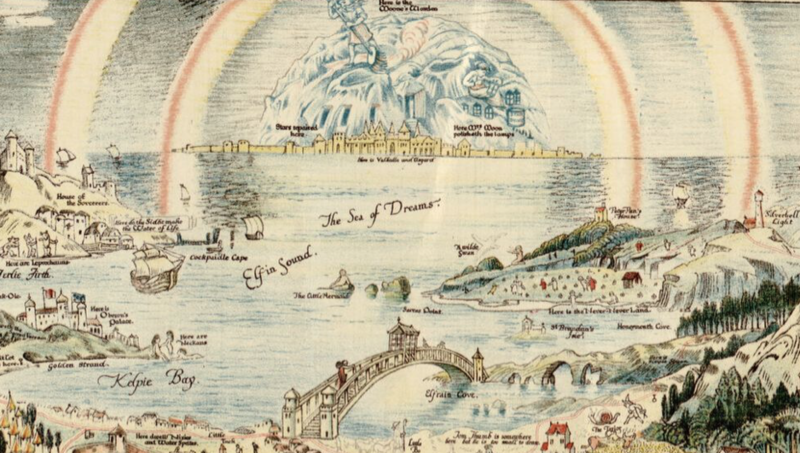 In 1917, one of the early adopters of Barrie’s Neverland fantasy concept expanded on its world with a version called “Fairyland,” described in an illustrated map of such a place. The artist, Bernard Sleigh, “begins with a stormy sea,” writes Jessica Leigh Hester at Atlas Obscura. (That is, if we read the map from left to right.) 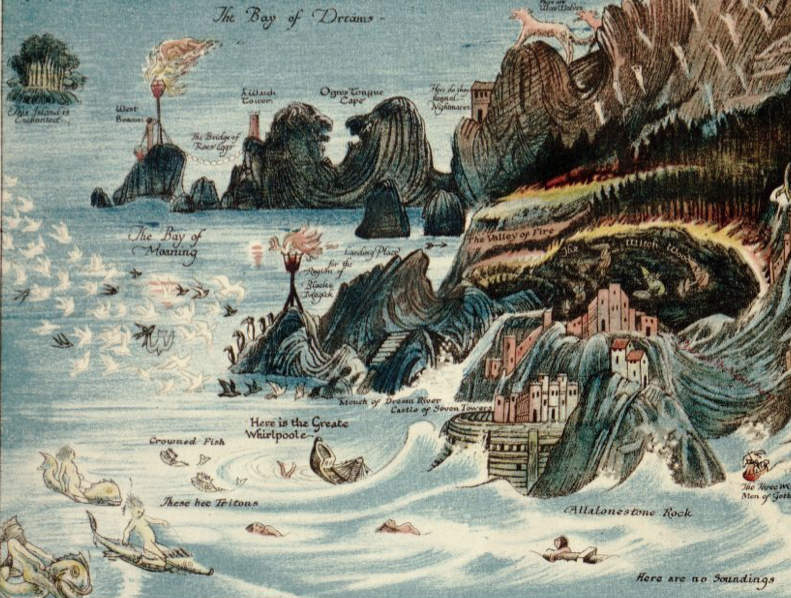 “There, waves lash the shore and tritons ride piscine steeds, while a wooden ship and an unfortunate soul are half-sunk nearby, in a white whirlpool.” The influence of J.M. Barrie’s descriptions is readily apparent. 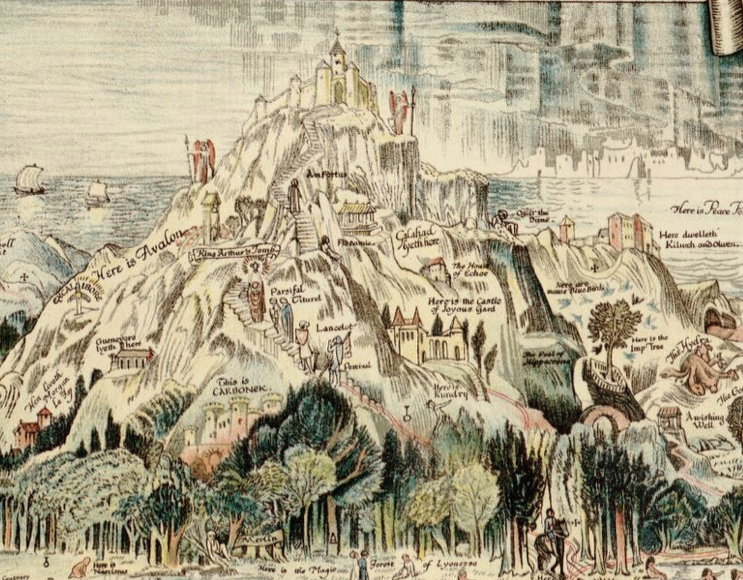 The Anciente Mappe of Fairyland (see the map in full here) “mashes up dozens of stories to make a comprehensive geography of make-believe,” writes Slate’s Rebecca Onion: “Rapunzel’s tower, cheek by jowl with Belle’s palace from ‘Beauty and the Beast’; Humpty Dumpty on a roof, overlooking Red Riding Hood’s house; Ulysses’ ship, sailing past Goblin Land.” It’s a “Where’s Waldo of Fantasy Easter Eggs,” by an English landscape painter “who wrote extensively about fairies in England.” Sleigh was not only a fantasist, he was also a true believer. 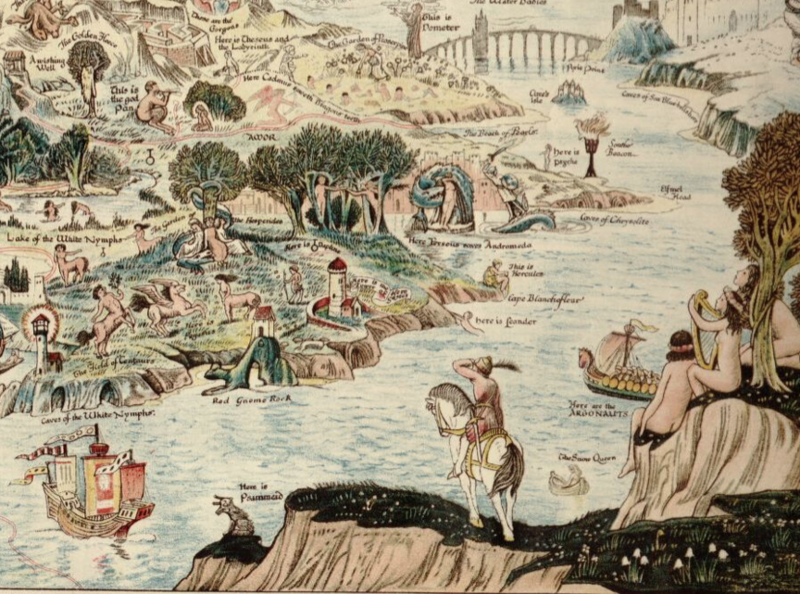 Download high resolution scans of An Anciente Mappe of Fairyland: newly discovered and set forth from the Library of Congress and the David Rumsey Map Collection, where you can also purchase a print. 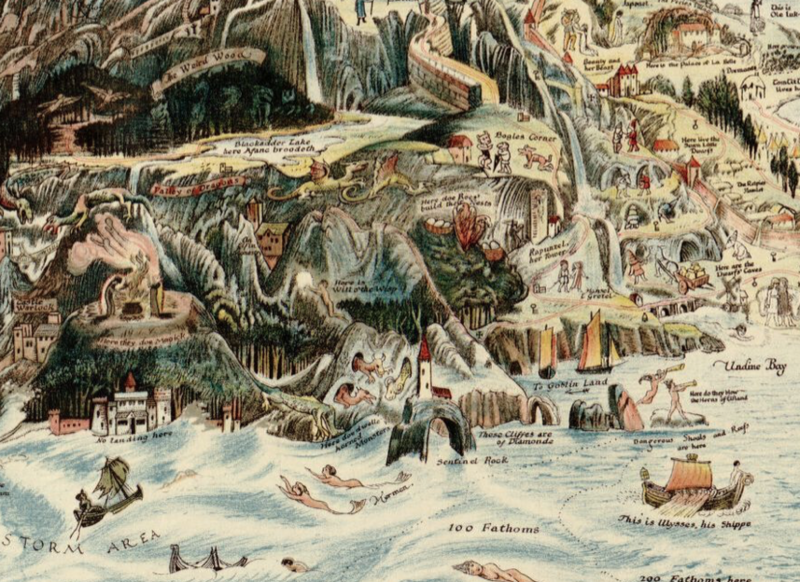 (The map physically resides at the British Library.) Zoom into Fairyland's intricate fantasy landscape and maybe take a break from the dark realities of yet another industrial revolution and a world at war.